Estadio Municipal de Chapin (or Chapin for the sake of brevity) is the home to new boys Xerez. The stadium is at its career high point right now due to the fact that Xerez has never played on the top tier ever before this season. So 2009 is the inaugural first season in the Primera Division for the new boys. Will Xerez be able to double that total next season? We will have to wait and see. 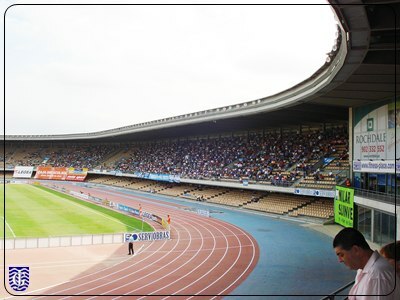 Chapin is among the newer stadiums in all of La Liga and the stadium was built in 1988. One element that you can see might affect a fan’s viewing pleasure is the great, big track that surrounds the pitch. Officials have discussed removing the track and moving the seating closer into the grounds, but such an act would cost a lot of money in remodeling fees and Xerez is likely to keep their stadium just the way it is. The stadium holds a little bit over 20,000 seats in it making it among the smallest stadiums in the Primera Division. Xerez and their B squad are the only two clubs that play in the venue. The grounds does hold other events too, but football is the primary spectators sport for Chapin. One of these events that has been held there is 2002 FEI World Equestrian Games. For this event a hotel was added to the adjoining stadium, the grandstands were covered with a new roof, and a spa-gym was added for guests. Very classy, Xerez. Very classy.